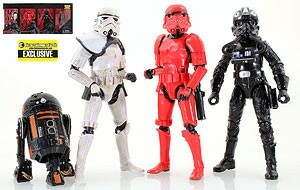 This is Entertainment Earth’s first-ever 6-inch The Black Series exclusive with four additions to the army of the Empire. It includes the first-ever Crimson Stormtrooper action figure, who is backed up by pilot Lt. Oxixo, a Sandtrooper Sergeant, and the black droid R2-Q5. Sandtrooper Sergeant – The Black Series debut! Includes a white pauldron, backpack, rifle, grenade launcher, and Stormtrooper blaster plus his survival backpack. Figure measures 6-inches tall and sports 26 points of articulation. Crimson Stormtrooper – world action figure debut! The red Stormtrooper has never before been seen as an action figure, and here is your chance to get the very first one in any size. This red trooper serves the will of the Emperor with a rifle and a blaster. Figure measures 6-inches tall and has 26 points of articulation. Lieutenant Oxixo – The Black Series debut! This TIE Fighter Pilot serves the Imperial forces on the Death Star above Endor. He has a uniquely painted helmet with a distinctive silver crest separating him from his fellow squad members in the Imperial Navy. Figure measures 6-inches tall, features 24 points of articulation, and a working holster. R2-Q5 – The Black Series debut! With spinning wheels, a rotating dome, and a retractable third leg, this black robot has all sorts of secrets under his bronze panels. Figure measures 3 1/4-inches tall and features 6 points of articulation. Unique desert walker vehicle with exclusive deco and a special Episode 7 trooper you’ll only find here. Walker is brown camo, seats 1 figure, articulated legs and cannon. Figure has red shoulder pad. Entertainment Earth’s first-ever 3 3/4-inch exclusive Star Wars vehicle. Includes exclusive First Order Stormtrooper Officer 3 3/4-inch action figure with blaster and a red pauldron – you won’t find him anywhere else! This boxed set brings you an action figure and a vehicle together for the sole purpose of stomping out opposing forces. This 7-inch tall vehicle features an articulated chin gun, jointed hips, and moving ankles. The brown vehicle includes red highlights and unique deco you won’t find anywhere else. The 3 3/4-inch First Order Stormtrooper Officer is designed to stand perfectly atop his mighty mechanical monster, and features fully-articulated shoulders, hips, and a neck too. His blaster is painted with black details and is specially designed to plug right into his thigh rather than deal with bulky and antiquated holsters. Much appreciated for this content and for sharing!